I recently received a press release advertising an event called Rioja Tapas Fantasticas, which is going to be held later this month, at a point when it will hopefully have stopped raining. At this event, punters will be able to sample wines from rioja and food that might suit them – at the same time! And not only that, there’ll be other stuff too. Would I mind terribly, the PR asked, if they sent me a couple of bottles? Tapas fantasticas? I said, surely not the same Tapas Fantasticas that was named medium-sized event of the year at the UK Event Awards 2010? Well no, I wouldn’t mind. So, as you can see above, I did. And the wine was lovely. 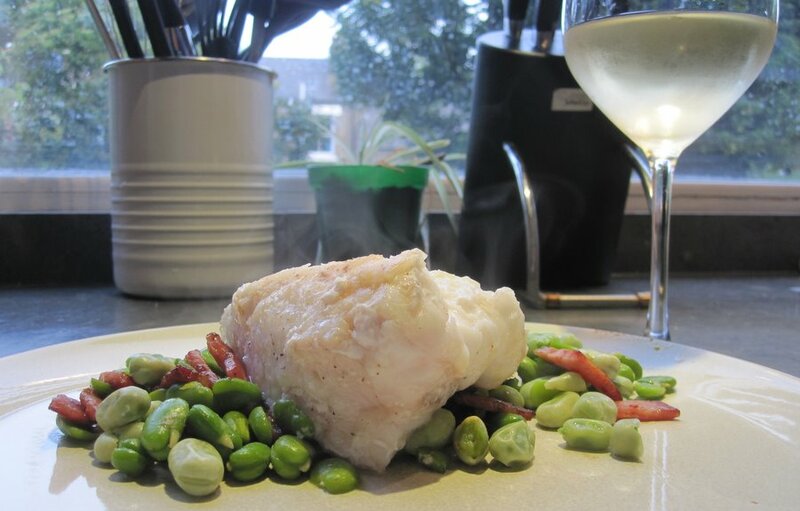 The monkfish and broad beans, though, was rubbish. As if prepared by a total idiot. Of course I couldn’t be arsed popping every bean out of its milky skin – I mean, really? – but that wasn’t the problem. It was just terrible, a flavourless, artless mess. Mainly because the “sauce” was so disgusting it never even made it to the plate. This poor, beautiful fish died in vain. The poor bycatch of the beautiful fish, which had already died in vain, had actually died in double-vain. In an incredible amount of vanity. The wine, some of which I wasted on the “sauce”, improved it, but what this dish really needed by way of accompaniment was a bin. White rioja is terribly trendy at the moment. It’s this year’s alternative to sauvignon blanc, the clean, characterful but not-yet-cliched white-of-choice for the summer months. This one is ordinarily £9.99 at Majestic, but currently down to £8.49 if you buy two (and available elsewhere for closer to the offer price). I genuinely like it, packed as it is with grapefruit zest and citrus oil, with a dash of cream from the evident but not aggressive oak. Once I’d stopped eating I felt it perhaps lacks a little crispness and acidity to get the mouth tingling by itself, but it’s impressive value at its (discounted) price, and very good with food. Even bad food. This entry was posted in Uncategorized and tagged cooking, rioja, tapas, tapas fantasticas, white rioja. Bookmark the permalink.